When a recipe travels through time and passes from generation to generation, then it’s a good recipe. It was given to me years ago by the woman who taught me how to roll out pastry sheets and since Christmas is close, I’d like to share it with you. Well beaten clarified butter and just a hint of orange are the key ingredients for these delicious Christmas cookies that melt in your mouth. Happy Christmas!!! In the bowl of your mixer, beat butter & sugar on high speed for 20 min till you have a white, fluffy cream. Add vanilla, orange zest & brandy and mix on low speed. In a separate bowl, whisk well flour, semolina and baking powder. Gradually add the flour mixture and mix on low speed. Take the dough out onto your working bench. It will be quite crumbly. Gather it with your hands until it comes together.Wrap it with food membrane and allow to rest for 20 min. Take small pieces of dough and shape them into balls. Arrange them on baking trays lined with parchment paper. Gently press their tops with your finger so that they won’t crack while baking. Put an almond on top of each cookie and press it to stick. Bake in a preheated oven, at 180⁰C / 350⁰F for 20 to 22 min till they’re lightly golden. The cookies are ready when they have an even golden brown bottom! 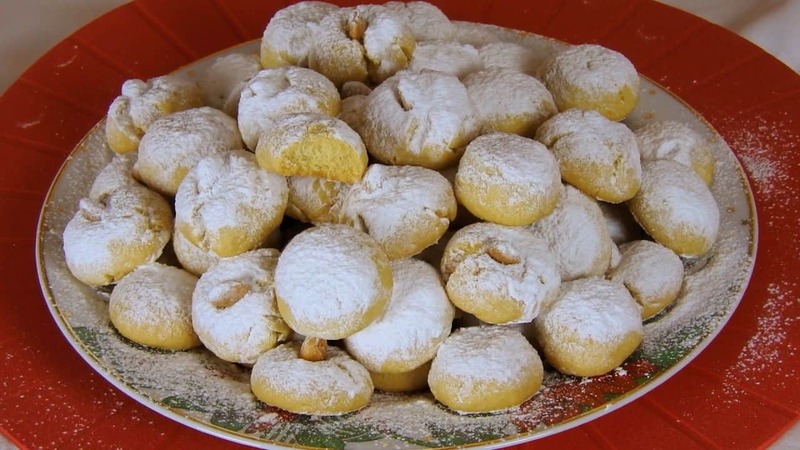 Let them cool completely and transfer on a baking tray covered with powdered sugar. Sprinkle generously with powdered sugar and enjoy!